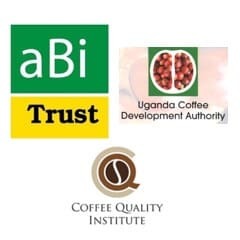 From 2012 through 2015, Coffee Strategies was contracted to provide value chain and capacity development services through the Coffee Quality Institute for the Uganda Coffee Development Authority funded by aBi Agribusiness Initiative Trust. aBi Trust is a multi-stakeholder entity devoted to private sector agribusiness development in Uganda. Numerous project activities were contracted over four years of engagement as part of a longterm strategic to improve coffee stakeholder value in Uganda, which is primarily Robusta coffee production. Development of tools and systems for mapping of flavor profiles per region for marketing and long term strategic planning. This includes systematic measurement of variables that affect Ugandan Arabica and Robusta coffee cup quality and flavor profiles. Information collected included variety (including native landraces), soil, altitude, temperature, processing methods and other factors. Coffee grading and cup quality assessment training and development was provided for Arabica and Robusta coffee stakeholders within Uganda. Emphasis was placed on the transfer of technology and development of in-country instructors to provide continuous training services for others. CORE is a Robusta-focused institution with activities including research, training, quality certification, flavor profiling and education for coffee farmers and exporters. Coffee Strategies was involved in the initial strategic planning for the organization and implementation of some of its early programs. The Africa Taste of Harvest program is a regional coffee cupping competition and auction that recognizes excellence in quality achievement by coffee producers in participation nations. In 2014, Andrew Hetzel was head judge of the Uganda national program and also head judge of the international Robusta competition. Andrew Hetzel completed and published the first compiled set of standards and protocols for Fine Robusta quality evaluation. Developed in cooperation with the Coffee Quality Institute (CQI) and funded by a grant by the ABi Agribusiness Initiative Trust, the document is the first comprehensive guide of best practices used to differentiate Fine Robusta, a premium quality distinction for analogous to the specialty tier of the Arabica coffee species, from ordinary commodity Robusta coffee. Coffee Strategies designed and executed original workshops focusing on export marketing for specialty Robusta products and techniques to build market connections, as well as to inform exporters on work in progress including but not limited to the Robusta Standards and future planned activities activities.